Final of the 33º individual national Championship in Portugal Draughts (Damas Classicas) was played on November 23, 2013 from 10.00 a.m. in the G.D. Jose Ramiro, Lisbon. Manuel Vaz Vieira and Tiago Manuel played for the 1st place in the Final of 2013. Manuel Vaz Vieira was a champion of Portugal in Damas Classicas 14 times. Tiago Manuel was the third in the championship 2010. See the history of the championships HERE. See current information from event on the site of Portugal Draughts Federation HERE. Tiago Manuel won! See results and games. Tiago Manuel won having a victory in the third game. 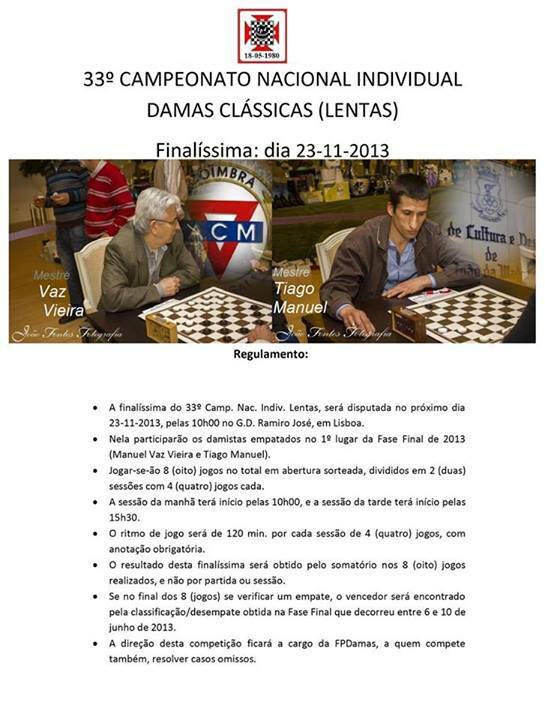 • Final of the 33º individual national Championship in Portugal Draughts (Damas Classicas) will be played on November 23, 2013 from 10.00 in the G.D. Jose Ramiro, Lisbon. • Manuel Vaz Vieira and Tiago Manuel will play for the 1st place in the Final of 2013. • Eight (8) games will be played, divided into two (2) sessions on four (4) games each. • The morning session will start at 10:00 and the second session will start at 15:30. • Time control is 120 minutes for each session of the four (4) games. Recording of the games is required. • The winner is determined by the sum of points obtained in 8 games. • If after the end of the 8 games the result is a tie, the winner will be determined according to the classification / tie-break, received in the final which was held between 6 and 10 June 2013. • FPDamas is organizing and holding the event and decides in the cases of the missing in the rules of championship.